The Legal Department of the LRB was abolished and we were all made redundant. I was entitled to my pension for the rest of my life and received a handsome redundancy payment. I invested some of the redundancy money in stocks and shares and placed the remainder in a building society. My ‘staff’, crowded around my desk, Liz Adams on the left. The legal library, which I was assured was the biggest in London outside the Law Society Library, and for which I was responsible, was divided into lots and sold to the highest bidders. I went home wondering what I was going to do with the remainder of my life. I had applied for a post with the Royal Academy as the Academy wanted someone to help catalogue their collection of works of art, but was unsuccessful. My boss who had written a glowing reference for me wrote them a stinging letter saying they had made a grave mistake in turning me down and they would never know what they had lost in doing so. Which was nice of him. It was just as well I was not appointed as it would have interfered with our eventual plans for retirement out of London and would certainly have curtained our travelling and the leave they offered was not as generous as Local Government or the Civil Service. And anyway another job was offered to me that was extremely generous both in leave and remuneration. 1991. Retirement; the National Trust and Legal Librarian. Not knowing what on earth I was going to do with myself. I contacted the National Trust to see if I could work for them as a volunteer to help with the cataloguing of their paintings. I felt that my lifetime knowledge gained from attending exhibitions and visiting art galleries all over the world and reading book on art for most of my life should be put to some use at last. I was interviewed by Alastair Laing and was told that yes, they could do with some help in getting onto screen all their material which was currently housed on large cardboard cards which had been created by his predecessor St John Gore. However, there was no spare computer available, but I could share with his secretary. There were very few computers available in those days at the NT, most work still being done on typewriters. I could not remember when I had last heard typewriters clicking away. So I shared the computer with Laing’s secretary. I started work one day and instead of working on cataloguing I was shown years of unfiled correspondence, currently in stacks on the floor under the secretary’s desk and every spare space on the floor that could be found, which included many unanswered letters which I found rather shocking. In all my working days in local government, I was expected to give a quick acknowledgement and a response as soon as it was possible. Both offices were in a chaotic mess, books, papers and files all over the floor. Laing could not use his desk because it was covered with heaps of papers and books and he did all of his correspondence writing in longhand on a pad of paper on his lap. I was appalled that anyone could tolerate for one moment working in such utter chaos. For three weeks I did nothing but filing. At the end of this I thought enough is enough, I certainly now knew how the office functioned, or didn’t, and where files were to be found, but I did not come here to do the filing, so I demanded to start work on cataloguing. Laing’s predecessor had created a mass of cardboard cards, each representing a painting which he had covered in typewritten notes. Laing had added to these in longhand rather than typing and rather than adding a card he chose to write all around the edges of the existing card. His secretary then created a new card by copying everything she found on the old card, it was then checked and further handwritten amendments made and the card retyped and presented for a second time. You can imagine how long this process took for just one card to be updated. The sheer waste of time and inefficiency I found intolerable. If Laing had only typed in his additions in the first place as clearly Gore must have done, the whole system would have been in much better shape. In fact I felt that Laing has stepped backwards. The card system was pretty much state of the art when created by Gore, it certainly was not now, in fact the cards were now in a terrible mess. The first thing I needed to do in order to prepare the way for a data base, was to break down the entries of the paintings catalogue cards into component parts so that at some time in the future those component parts could be easily transferrable to a database. I drew up a specimen breakdown, dividing all the information into specific headings, artist, title, date, size, materials, provenance, etc., and Laing entering into the spirit of my scheme, the last time he was to do so, and introduced a few more break-downs of the material. And so I began to put them on screen, all entered into new component parts. So began my long period of volunteering with the National Trust. On one occasion some weeks after I started work at the Trust, he was informed that his and his secretary’s room would have to be packed up and moved as it was intended to decorate the rooms. He promptly arranged to go on holiday as did his secretary. I suppose they thought the staff at the NT would take responsibility. I turned up for work, unaware of this and was faced with a mass of removal men asking how I wanted things packed and where I wanted them placed in the temporary offices in which everything was to be transferred. I realised that someone had to take responsibility or chaos would ensue when it came to returning everything to its rightful place and in its proper order even if it meant returning them to their heaps on the floor. Laing’s room, for instance had a vast and valuable library of art books, many of them on the floor because no one had made an effort to order bookcases to accommodate them, a huge collection of correspondence files in filing cabinets and a mass of filing cabinets which contained large black and white photographs of every painting held by the trust, all in alphabetical order of artist and properties. Each of the cabinets had to be emptied into boxes, before the metal cabinets could be moved and obviously it was necessary to ensure that they were taken out in a particular order so that they could be returned to their empty cabinets as they were found in due course. The sheer audacity of leaving me with such a responsibility was unbelievable as Laing and the secretary made for the hills. I should have walked out and left them to it but I took on the challenge and supervised the move to the temporary accommodation, saw all the files and papers unpacked, as people still wanted to refer to them, and then packed again and returned to the newly decorated rooms, I hope a little bit tidier than they had left it. Laing and secretary then returned and found everything just as they had left it. I think the pair of them thought the ‘little people’ had done everything and the secretary expressed her thanks through clenched teeth when she realised that I had done all the work, and he in his usual casual manner, swept into the office, wished me a mumbled good morning, handed some papers to his secretary, said how nice it was to have the walls painted and swept into his room. I became so angry at his thoughtlessness that I told the secretary exactly what I thought of the irresponsible, ill-mannered pair of them and went home. A couple of days later I got a very abject apologetic letter from Laing saying he was totally unaware of the excellent work I had done, which I frankly did not believe. However, I was not going to let them defeat me and so I returned, because I thought I could make a difference to the administrative chaos that reigned in the department. Why were years of unfiled correspondence left in piles under desks and in cardboard boxes when there was a perfectly good filing cabinet system put in place by Gore. Why were random heaps of books and papers scattered on desks and tables everywhere. I always judge a person in their office by the state of the surface of his/her desk, and usually find that the most hardworking and efficient ones are those with an ordered desk. When I was organising the unfiled correspondence, I discovered at the bottom of an old cardboard box the massive typewritten illustrated manuscript of Richard Walker’s ‘Portrait Miniatures in National Trust Houses’. Clearly long forgotten. It was covered in dust and coffee stains and had been dumped in the box at some time and because it did not quite fill the box to the top the box had been used to house a mass of unfiled correspondence. I placed the manuscript in a set of binders and there they stayed till they were finally partially used to publish two slender volumes of portraits in Northern Ireland and Cornwall, Devon and Somerset. For those who are unaware of who Richard Walker is, I will give his credentials by giving the title of one of his many published books Miniatures in the Collection of Her Majesty The Queen. The Eighteenth and Early Nineteenth Centuries. One of my treasured books. All the previous material he gathered has now been incorporated into the NT data base system called CMS (Collections Management System), which I did personally when I made all the entries for the NT’s magnificent collection of miniatures. Many alas kept in storerooms and safes. As for the numbers of unanswered letters. These were scattered all over the place. One of the later secretaries in despair after many complaints had been received and she blamed, had a rubber stamp made which stated that the letter had been unanswered by Laing, so that she did not have to take the blame for them in the future. One of his secretaries was nicknamed ‘the shopper’ as the minute Laing left the office. which he invariably did for most of the day, presumably doing research elsewhere, or sometime going to visit houses, would also leave ‘to do some shopping, won’t’ be a minute’ and would return hours later, arriving back just before he did. And does anyone wonder why the office was in such a mess. And as for thanks, that was handed out, if it was handed out at all, in a very sparing manner. Remember I was a volunteer, and did not get a penny for my work, all done for love; the least I could expect was thanks. I remember that I spent months placing on screen the material relating to all the paintings in Hardwick Hall, a massive task. And because Laing only worked from paper and not screens I had then printed out all my work and filled two, or was it three three-inch thick files. All this I had carefully transcribed into the new agreed breakdown headings, from Gore’s typed cards which had then been covered in Laing’s longhand written script. Well, anyway, very pleased with my work, I went into his office, wagging my tail like a fool, hoping for a pat on the head at the very least, and stood there holding the files as there was no space to put them on his desk. I waited till he deigned to look up from his writing, and explained what I held in my hands and got the withering ‘Oh put them down there’ pointing to a space on the floor and continued with his writing. Those words still burn into me after all these years. Whatever happened to good manners. But, in spite of everything, I loved what I was doing and knew it was making a difference. Looking back, it is good to know that all my hard work paid off as it was eventually easily transferred to the NT data base all neatly set out under my original breakdown headings and available for all to study. But that’s another story. I had hardly begun work with the Trust when I was contacted by a firm of solicitors, who were parliamentary agents whom I had employed to do some work for the LRB, a case which had landed in the House of Lords and which we/they won. They wanted to know if I would be interested to work for them as their librarian and for me to catalogue and look after their extensive library. They offered a handsome salary, only required me to work three days a week, which enabled me to continue work with the NT, and left me to my own devises. They provided me with a computer, asked me to design a library for them in a suite of spare rooms and left it to me to select an appropriate assistant to work with me. I selected one of my staff from the LRB, Liz Adams who, of my small group of staff, had been the most supportive, trustworthy and hardworking. I rang her up and offered her the job. She said she had been sitting by the fire in her flat wondering what the hell she was going to do with her life and then I called. We got on famously; she was crazy about donkeys and was the secretary of a donkey sanctuary somewhere. She was unmarried and her only family, consisted of her father, her mother having died when she was young. Before coming to London to work, she had lived in some comfort in the north of England, her family home had a stable block and had so many rooms that she had never been in some of them. She had settled down to what appeared to me to be a rather lonely life in London; but she never spoke of her life. She was to die of cancer a few years later. So now I had two jobs, both absolutely up my street, one very well paid, one voluntary and my pension from the GLC/LRB. I was very content. Retirement: William and the Central Office of Information. In the same year William sought and obtained early retirement from the Civil Service. He had worked for some years with the Central Office of Information, beginning with his being sent to cover all the art exhibitions and gallery openings in London. This way we acquired a large number of very expensive catalogues to exhibitions he attended. He had gone to the COI to seek a change from military matters at the Ministry of Defence where he had worked for many years. The COI is a government department, and the part of it in which he worked provided British embassies abroad with reports concerning among other things, the programmes arranged in the UK for VIP’s representing large overseas companies. William’s activities included interviewing the VIP’s, attending press conferences involving them, and sending back reports to British embassies in their countries. On one occasion wearing evening dress he had to attend a banquet at the Guildhall in London in honour of the then president of Portugal. That involved reporting on the proceedings before returning quite late to the COI still in his bow tie and tails to prepare the report and send it that night to the Embassy at Lisbon. Apparently the food at the Guildhall banquet was appalling to almost uneatable. 1991 – April – Florence Prato Lucca. We took an independent holiday to Florence to visit all our favourite galleries and churches in a leisurely manner and to visit Prato and Lucca. It was extremely cold and in fact when in Prato we hit a snow-storm. We stayed at the Brunelleschi Hotel, very comfortable. We were first allocated a small dark room which was the size of a postage stamp, I returned to reception and managed after a great deal of argument to get us a better room. It was beautiful, why could they not have given it to us in the first place. Prato. The city has some splendid ramparts – Castillo dell’Imperatore 1237-48. Our first stop was Santa Maria dell Carceri by Sangallo 1485. Rather bare cold interior with some Andrea della Robbia pieces. The Duomo is magnificent. Particularly because of the frescoes by Filippo Lippi of the Life of St John the Baptist. My favourite was The Banquet of Herod which starred Lippi’s mistress as Salome. We had a picnic lunch on the town ramparts and just as we got to the station to return to Florence we were caught in a snow-storm. Lucca. The Cathedral, consecrated in 1070. It contains a Last Supper by Tintoretto and a Fra Bartolomeo’s – Virgin and Child and of course it contains the world famous masterpiece, the sculpted tomb by della Quercia of Ilaria del Caretto Guinigi (1408). On to San Michele in Foro begun 12th century with a clutch of saints including Jerome, Sebastian and Roch by Flippino Lippi. 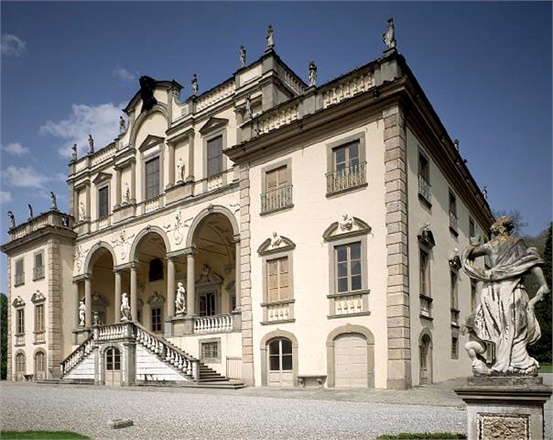 The art gallery is housed in the Palazzo Mansi and has marvellous portraits by Sustermans, Bronzino, Pontormo of the Medici family. And finally Santa Maria Forisportam 13th century with two paintings by Guercino. Managed to find a copy of the complete works in the Uffizi, very heavy tome, now one of my prize possessions. Mother in New Zealand, 1991. My mother decided she would like to meet up with one of her oldest school fellows Nora, who lived in New Zealand and with whom she had corresponded since leaving school. So we put on her the plane and off she went. By all accounts she had a fabulous time and indeed towards the end of her three weeks there, she phoned to say she was staying on another three weeks. I’m so glad she and Nora got on so well after all those years; she had not seen her since they left school. Herbert Holdaway dies April 1991. Uncle Herbert, my father’s eldest brother who had lived with Roy McMahon for many years, and had, on Roy’s death moved into a residential care home, died. I did not care for him, though I assumed he was gay. In appearance he was rather dapper, prim and tight-lipped. Had no conversation whatsoever – the result, presumably of years of living alone in India with his horrible mother. Apparently they had no friends socially and his mother was unable to keep servants for long because of her sharp ill-mannered tongue and frequent slaps which she was prone to give to servants, this witnessed by my parents. There were always ancient photo albums of good looking young men, probably taken in the 1920s, wearing very little, which were stacked at the side of his chair at Roy’s house. He was very close to his mother and indeed lived with her all her life. It was he and his mother who refused to give refuge to my father when he was in dire need before he finally left India. My father wanted to have little to do with him or his mother on their arrival in England. I could not forgive him for the way he and my awful grandmother acted towards my father. He left his whole estate to the National Front. Why was no one surprised? 3rd December 1991. My sister Anne’s second husband Frank Henry Duffield, died of cancer. He had been very unwell for many months and Anne had had to nurse him at home as he refused to go into hospital. She was devastated and all alone in Bridport and she had to find a job to pay the bills. I now fully understand how she must have felt and the grief that must have overwhelmed her. May 1992, Cornwall. we took my now widowed sister Anne, and my mother on a holiday to Cornwall. Visited all our usual places. However, it is what happened afterwards that became important and was to affect our lives. At the end of the holiday we drove my sister Anne back to her home in Bridport in Dorset. We arrived at her delightful bungalow, lovely garden, she had become an excellent gardener. The sun was shining, it was peaceful and quiet and we had tea outside in the garden. Then we drove back to Bayswater. It was hot and humid, the noise from the police cars, the busses, the crowds, one of our more disreputable neighbours was standing on the road, screaming obscenities at another neighbour who was giving as good as he got. It struck both William and I like a bolt of lightning, ‘What on earth are we doing living in this hell when we could be living in peace and quiet in somewhere like Dorset’. I think for me the moment passed but it stuck in William’s head and unknown to me he became quite myopic about the matter and determined that we should buy ourselves a holiday bungalow in Bridport and have a bolthole where we could escape from London and Watford. Thank goodness he did. It was one of the most important decisions we made and it was all due to William’s absolute determination. Toledo. Our first port of call was the 16th century Hospital de Tavera built for some obscure Cardinal. We went there to visit the Museum founded by the Duchess of Lerma which is in the form of a reconstructed 16th century mansion of a Sanish nobleman. Flemish tapestries and a rather small but good collection of paintings including an El Greco, Tintoretto, Ribera and a Zurbaran. Lovely and cool. Hardly any visitors so virtually had the place to ourselves. Baptism of Christ by El Greco. Hospital de Sta.Cruz (Renaissance). The former wards of the hospital now house a museum with a collection of tapestries including a set of the Life of Alexander the Great. Again small but good collection of paintings, Moro, Morales, Ribera and even a Goya Crucifixion. The Alcazar dominates the whole of the city but was blown up in the Spanish Civil War and rebuilt. Goodness know what it is used for, we did not bother to visit. The Cathedral is magnificent. Mainly 13th century. Excellent collection of painting, A Giordano ceiling, works by El Greco, Bassano, a Giovanni Bellini Burial of Christ and a Van Dyck Holy Family. The St Tome church with its stunning El Greco of the Burial of Gonzalo Ruiz, Conde de Orgaz. Wonderful to see in in the flesh so to speak. The House of El Greco. where the artist live and died was formerly part of a palace, contains a few El Greco paintings, a Murillo and a Zurbaran. Just fascinating to see the place where he actually lived and worked. 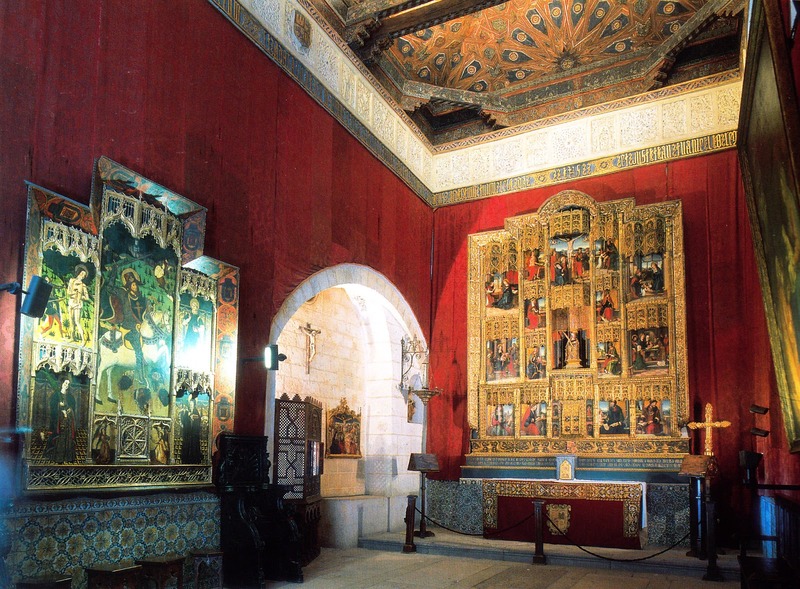 The Casa de Mesa 15th century decorated in the Moorish style. Very beautiful. Avila. Famous for its walls built in 1088 with 88 cylindrical towers and nine gates. The cathedral built of granite was begun in 1157. The north door is a stunner with a mass of statues and a carved tympanum (13th century). The paintings on the main altar are a wonder and I see some of the panels are by Pedro Berruguete (fl.1477-1504) who we were beginning to discover and look for. We had lunch just outside the cathedral in what was a former convent: an absolutely delicious stew. We then decided to walk outside the city and see the walls. Scorching hot day, but the walls are an unforgettable sight. Segovia. Dominated by the massive Roman aqueduct dated 98-117 AD. The very impressive Gothic Cathedral. The Royal Palace of La Granja de San Ildefonso. I see from my diary that we also visited the palace in the small town of San Ildefonso located in the hills near Segovia. Very sparsely furnished but with a good collection of tapestries, some from cartoons by Goya. 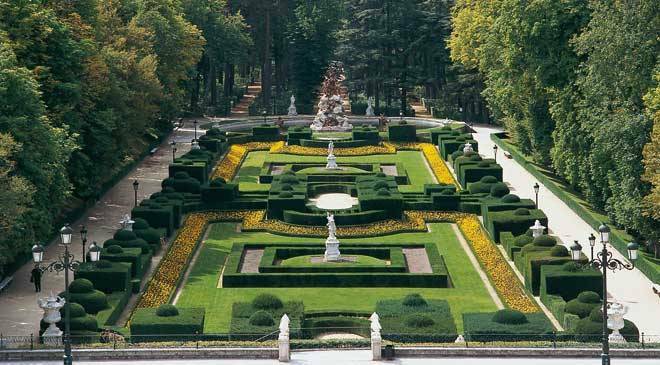 The formal gardens are a delight, awash with fountains and with a huge lake. El Escorial. We finished up with a day at the Escorial. We had visited it before but took it very leisurely this time. The day before we departed I happened to look at some posters which were appearing all over Madrid and from them we understood that on the day of our departure there was to be a national strike. Which would mean that all the transport, airports, etc. would be closed. We phoned BA with whom we were booked and said ‘Help’. They were marvellous, and suggested that we curtail our holiday by leaving that day and they would arrange a flight for us. They said get packed and come straight to the airport and everything would be arranged by them. We did. They did. We flew back that same day. What a relief. August 1992. Bridport. We came to Bridport to look over some properties with the view to buying a holiday home for us. William was now absolutely determined that we get a place in Bridport. It also has sentimental connections in that his parents met in Burton Bradstock a few miles down the road. Did not like any of the properties. Will try again. William had a cousin who was one of the captains on the QE2. He kept on saying we should take a cruise and he would see if we could not be bumped up to a decent cabin if one was vacant. So we decided we would give it a go. We booked a quite cheap cabin and duly arrived at Southampton to set sail. It was called an Iberian Cruise and was for seven days. What attracted us was the fact that there were lots of excursions planned so we did not have to swan about the boat avoiding all the pleasures of the gym, swimming pool, learning how to play bridge, etc. The cousin had just finished his voyage and came to meet us. We were sailing another Captain John Burton-Hall We were shown to a magnificent cabin, very Hollywood with mirrored dressing room for enough clothes to suit a diva, lavish bathroom, beautiful beds etc. Two bottles of champagne in ice buckets. An envelope was delivered full of complimentary tickets for all the excursions, together with another bottle of champagne. As neither of us like champagne and I can’t stand the taste of alcohol in any form, it was a bit of a waste. We gave them to the cabin crew. We dressed in evening dress and bow ties each night for dinner. Dinner was served in a special dining room which was obviously meant for the super wealthy, presumably with rooms like ours. We had been placed in the centre of the room under a massive rather unnerving carving of the royal arms. Our fellow female guests appeared each night in different ravishing gowns, loaded with jewellery and I don’t think I had seen so many men wearing such large jewelled signet rings, maybe it was all the rage that year. Everyone had their own table so we never got to speak to any of our fellow diners, anyway I think most of them lived on a different planet to us. Cruising. The first day we spent cruising and we walked about the ship, past the large gambling machines with ancient seated ladies playing with buckets of coins by their side, the gyms, the card rooms, the cinemas, beauty parlours, shops, the swimming pool, etc., etc. Really the ship was wasted on us. And then there was the food. We were served a massive breakfast, then a massive lunch, and when I say massive I mean massive, followed by tea in the afternoon with every type of sandwich and cake known to man, following by a massive dinner and for those who were still peckish a midnight buffet was laid out which stretched from here to there with everything you could not possibly want to eat at that late hour. No wonder the gym was bursting with people. However we did like standing on the open deck in the evening watching the sun go down and some mornings to watch the sun rise. Time and time again, we found ourselves alone on the outer deck, everyone else, dancing, watching the cabaret or films, playing card games, gambling, or asleep. In the evenings it was nice hearing the dance bands playing in the distance. We did however have the regular fleeting company of one fellow guest, who like a rat running in one of those wheels that turn around and around jogged past us, again and again leaving a trail of scent, sweat and cigar smoke behind him, and who shouted ‘Hello boys’ each time he passed; Jimmy Saville. I hear he was thrown off one of the QE2 voyages for misbehaving himself it certainly wasn’t ours because we had the wretched man every morning and evening. Santiago de Compestela. Our first stop was Vigo where we were bussed to visit the cathedral of Santiago de Compostela. Before we visited we were taken to the 16th century Hostal de los Reynes Catolicos a luxury hotel where we were plied with a buffet. It appears that St James the Great having landed in a stone coffin a few km south west, guided a bishop by a star which pointed to what is now Santiago. All absolute tosh. A chapel was built on the site and then it grew and grew into the great pilgrimage cathedral it is now. John of Gaunt claimed the throne of Castile through his wife and was crowned in the cathedral. When the treasury was plundered by Napoleonic General Ney he found it to be virtually empty as the resident clergy had been helping themselves over the years to all the magnificent offerings that had been lavished on the cathedral by its visitors and pilgrims. The present building was begun in 11th century. There are some great carvings on the exterior and the Romanesque interior is extremely impressive. 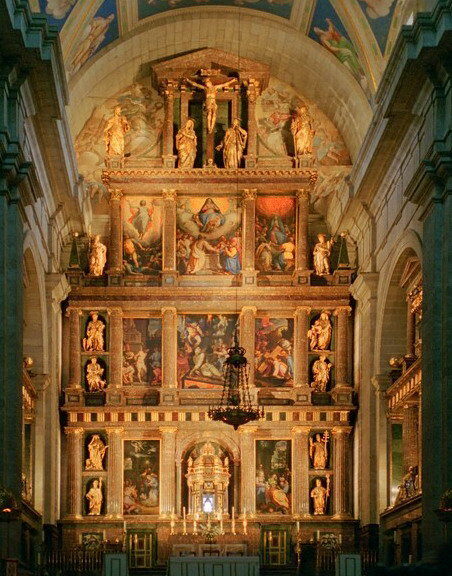 Behind the altar is a stairway which leads you to where the credulous can kiss the mantle of the image of Santiago. In a small crypt below are exposed some bones of the saint and two of his disciples. Another chapel has some interesting effigies of the kings and queens of Leon. Another sports some five mid-15th century Nottingham alabasters. Virtually all our Nottingham alabasters having been destroyed by Henry VIII or his equally wretched son Edward VI, who were both the equivalent of today’s destructive Islamic fanatics. When one ponders on the loss of our artistic heritage during those short years in Tudor times, it makes my blood boil. Follow that with Cromwell destroying all our magnificent castles; makes the Talaban appear positively restrained. In order to soften the stench of the pilgrims reaching the delicate noses of the plundering clergy who ran the cathedral, a vast incense burner was swung across the church. This is only done on rare occasions but specially for us passengers on the QE2. Presumably for a handsome fee, the clergy swung the incense burner. It really is a terrifying sight. I believe it has left its moorings whilst swinging across on a number of occasions, the most famous being when it was swung in honour of Princess Catherine of Aragon before she left to marry Henry VIII. Make of that what you will. Gibraltar. The next day we stopped off at Gibraltar for the afternoon. The museum was a dusty dump. I hope things have improved since our visit. We ambled around, not much to see. I think we were marshalled to some flim-flam ceremony of the keys or some such. Soldiers being used as tourist attractions, which I think most demeaning. Why on earth should anyone want to visit Gibraltar? Malaga/Alhambra, Granada. The next day stopped off at Malaga and were then coached to the Alhambra for a hasty visit. One of the downsides of going with vast numbers of people is that you are perpetually in a crowd from which you cannot escape. There had been some mix-up with the coaches, not enough of them, so instead of leaving just after breakfast, it was very late in the morning before we all left, and as the boat was departing at 4 that afternoon, it was all hurry, hurry, wham bang, scram. Thank goodness we had seen the Alhambra in a quieter visit years before. Another disastrous organised trip. We were beginning to get very disillusioned with the whole cruise. Their excursion organisation was very poor, but then when you think of the vast numbers the organisers were having to deal with no wonder nothing went quite to plan. Lisbon. By now we recognised that the last thing we wanted to do was to join an organised tour of Lisbon. So we got off the ship and bid goodbye and set off to do our own thing. Fortunately it was only a short walk to the Museum of Ancient Art. 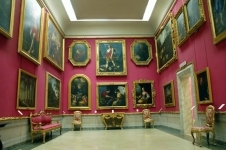 Remarkable collection, rich in Dutch and Flemish paintings, also has a good collection of Spanish, Italian, German, French and a tiny collection of English School paintings, including a Romney. However what we wanted to see most was the Portuguese paintings particularly the most famous work in the museum the Saint Vincent Panels (1470) by Nuno Goncalves (d.1492), court painter to King Afonso V.
The six large panels show people from all levels of late medieval Portuguese society venerating Saint Vincent, in one of the first collective portraits in European art. For me this was one of the great moments of the whole trip. Isn’t it magnificent? From there we took a taxi to see the Gulbenkian Museum. Incredible collection laid out as though it was a furniture showroom. All those treasures shown off in such a frightful manner was just unbelievable. To think many of the greatest paintings in the collection were actually on loan to the National Gallery just before war broke out and we had the stupidity to have Gulbenkian arrested as an enemy alien. He had more or less indicated that he would leave his collection to the UK but quickly changed his mind and no wonder. But what a wretched way to show off the collection. It is impossible to do justice to the collection so I have chosen one of the pieces which is one of those images I carry around in my head. St Joseph by Rogier van der Weyden. We then took a taxi to see the Jeronimo Monastery Very ornate with pretty cloisters. Then walked across to the Belam Tower 16th century. It was meant to be a defensive tower but looks more like a very decorative folly. We then walked back along the quayside in the quaking heat to the ship. Thank goodness we had decided to go off on our own. The following day spent at sea. We had been told that the QE2 had stabilisers, fat lot of good they were, we headed into a storm and I swear the boat started doing figures of eight. I was horribly seasick, William went for his lunch, and I could hear crockery crashing outside. There was an announcement on the tannoy system that if anyone wanted, a nurse would administer an injection to help people to deal with their sea-sickness. I took up the offer, at great expense and a nurse plunged a needle into my backside and within an hour I was right as rain, and enjoyed a splendid tea and dinner, the ship still doing figures of eight. Arrived Southampton the following morning and returned home. What a mess of a cruise, I never want to get onto a cruise liner again. The ships run by Swans had a purpose and were small, one could not help feeling that many air-brained people on board never left the QE2 but simply stayed on board, gorging themselves and spending time in the beauty parlour or gambling or watching films. 26th September 1992. My sister Anne married widower George Victor Steer at Holy Trinity Church, Bradpole, Dorset. I know they will be very happy together as indeed they are.